You’ll need to acquire a commercial septic permit application to get approved by the Florida Department of Health for septic installation in Tampa. At Southern Water and Soil, we know there are a lot of details to cover when it comes to adding a septic system to your property in Tampa, Florida. One of the most important items that you’ll need to acquire is a commercial septic permit application so you can get approved by the Florida Department of Health for the installation of this important system. There are several important steps to follow as you attain your septic installation approval, and our team is knowledgeable about this process so you can more easily achieve your goals. The first step in obtaining your commercial septic permit application is to visit the Florida Department of Health office in your county. They will be able to inform you about state and county ordinances and regulations that you’ll need to adhere to before ground-breaking on your septic system begins. Once you have obtained your commercial septic permit application, you’ll need to complete the required paperwork and submit it for approval, along with a site plan, building floor plan, and the required application fee. 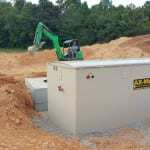 You’ll also need to schedule a site evaluation before your commercial septic permit application can be approved. This will allow the Florida Department of Health to determine the construction and septic requirements for your property. At Southern Water and Soil, we can direct you to the proper authorities for your commercial septic permit application, provide the necessary documentation as part of your application, and assist you with your site evaluation. You can also find some additional information about the requirements for your commercial septic permit application on the Florida Department of Health website. At Southern Water and Soil, we can help with commercial septic permit applications in Tampa, Odessa, Lutz, Land O’ Lakes, Brandon, Orlando, Plant City, Dade City, Bartow, Lake Wales, and Lakeland, Florida.